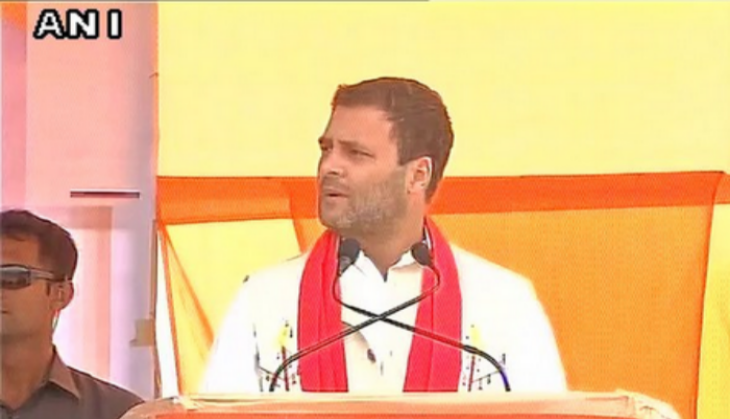 Following close on the heels of Prime Minister Narendra Modi's power-packed election weekend in Assam, Congress vice-president Rahul Gandhi addressed a rally in Diphu district on 29 March. 1. "Congress has brought peace in Assam in 15 years. It is one of our biggest achievements". 2. "Whenever I come to Assam, Gogoi ji talks about people of state, development in state. He wants to help you wholeheartedly". 3. "We want everyone to have equal rights in the country. Congress means unity in diversity". 4. "Modi ji arrives, formulate promises and leaves. You need to ask yourself, out of all promises made by Modi ji to you, how many has he actually fulfilled". 5. "Modi ji took away Assam's special status under which the state used to get thousands of crores of rupees under Congress government". 6. "BJP is seeking to impose its ideology forcefully on the country. This country does not belong to one ideology". 7. "Wherever BJP government goes, they set off violence among people. Everybody knows what happened in Gujarat and in Haryana under BJP's control. Congress party ruled Haryana for 10 years but no riot ever took place in the state". 8. "Vijay Mallaya met a minister in the Parliament and fled away with much ease with dozen baggage items. No attempt was made to stop him from fleeing and no one is trying to bring him back". 9. "The BJP did not even initiate the extradition process against Lalit Modi who has been on the run with thousands of crores of black money". 10. "Assam will be run from Nagpur, Assam will be run from Prime Minister's Office if BJP wins, we want to run Assam from Assam". Congress president Sonia Gandhi will address an election rally in poll-bound Assam on 30 March. Assam has a total of one crore 98 lakh voters. The Election Commission has announced two-phase voting for the 14th Assam assembly elections on 4 and 11 April, while the votes will be counted on 19 May.